Colin Youngson writes this tribute to one of Scotland’s best ever but least known marathon runners. Dave Clark came to marathon running comparatively late in his running career but had an amazing and swift impact and Colin covers his career in detail. David R Clark (Born 7th October 1943) developed rather late as a marathoner. He first broke 2:20 at the age of 35 in 1978, and for the next nine years had an outstanding career. Born in Aberdeen he went to Aberdeen Grammar School – as did Mel and I – and went straight to Aberdeen University from there. Arguably he became the most successful Over 40 marathon runner Britain has ever produced. When I joined Aberdeen University Hares and Hounds in October 1966 he had already graduated and moved South. His team mates had included Scottish International runners like Mel Edwards and Bill Ewing, and I knew that Dave had won a ‘half-blue’ for cross-country running. We first met after the British Universities Sports Federation Cross-Country Championships on Saturday 4th February 1967. This was my very first trip to London and nothing had prepared me for Parliament Hill Fields! After struggling through six miles of mud and hills, and finishing 77th from 270 (but second Aberdonian), I hope that I showered before we headed off downtown. Our guide was spectator Dave Clark, who made us walk ‘miles’ through the strange city before introducing us to his favourite Indian restaurant. There he encouraged us to sample curries hotter than hell. When we failed to clear our plates he did so with relish. Had he been born in India? Did he have a cast-iron stomach? Obviously a hard guy, despite his medium height, trademark spectacles and otherwise civilised demeanour. “I enjoyed running from an early age. At school it was not only an escape from team games involving balls but something that I was surprised to find myself quite good at. For most of my career I had survived on a theory based on the benefits of rest. A training run on a Wednesday for a race on Saturday was enough. However having done a 10 miler around 1970 and suffered in the last five, I was aware that longer distances needed proper preparation. So it was in 1975 that, encouraged by team mates who felt I could do it, I got it into my head to run a marathon before I retired from the sport. With a steady job in London the obvious way to increase the mileage was to use this journey to good advantage. So it was out at 7:20 am, then on the train to West Hampstead, Cricklewood or Hendon, and a run into Piccadilly Circus (via a patisserie) , a quick shower and ready to go at 9:00 am. Then in the evening, the same in reverse. I also extended my Sunday morning runs with my Verlea team mates, finding parts of the county I never knew existed. With confidence I tried an all-the-way-home run. John Dryden (Shaftesbury Harriers) took me his favourite route through Regent’s Park, Primrose Hill, Hampstead Heath, Golders Green to near his house in North London, leaving me to finish the run on my own. The route was as rural as possible and pathfinding was tricky but I made it and thereafter tried to do this run once a week if I had no serious race at the weekend. This regime, with additional runs through Hyde Park at lunchtime, eventually led to (one) week of 130 miles. But one of the first effects of this new regime was improved results at shorter distances – even when there was no easing up for the race. One early success – possibly because of the rural nature of most of the training – was a fourth place in the Orion 15 in March 1976, only a minute behind the winner. This is a wonderfully muddy cross-country course in Epping Forest which I have always loved. I had decided to make my marathon debut in Milton Keynes, the RRC Marathon in July, so the training was geared to that – the other races being part of the build up. So I was not disappointed in tenth place over 16 miles in the Clydebank to Helensburgh in April or 52:35 in the Hampstead 10 in May. By this time the temperature was rising and we were due to have a real barbecue summer. My plan for the marathon was to acclimatise myself by running the Welwyn Half Marathon the previous weekend without drinking any water. By ten miles I was in third place. My memory of finishing is hazy. I almost lost consciousness and was ill for the rest of the day, but later found out that I was fifth in 76 minutes. But the message was clear, drink early and drink often! This paid off the following week: the temperature was 33 degrees C (91 degrees F) but I loved it. Running with a club-mate, we agreed to start slowly and run together as far as we could. We were around thirtieth at 10K but still running steadily and seeing other runners drop out. I was eighteenth at 20K, tenth at 35K and finished ninth in 2:34:53 , tired but elated. The atmosphere was way beyond that of a normal road race – we were all survivors of a shared experience and I was hooked – the marathon was going to be my event. Later that summer I was a very close second to Graham Milne in Inverness to Drumnadrochit Road Race and then sixth in the Achmony Hill Race about an hour later. This crazy regime continued until September when I ran the Ben race as a training run the week before the Poly Marathon at Windsor. I was not too concerned about finishing 40th on Ben Nevis. Having dropped from the first ten at the summit, I was inhibited from running fast downhill due to a desire to remain alive with a full complement of limbs. I started the Poly full of confidence and felt very easy in fifth place in 53 minutes for 10 miles. At 20 I hit the wall. My eleventh place in 2:28:48 was respectable but in my first year I had learned a great deal about marathon running – and my own limits. From then on the event was not only in the blood but in the brain as well, and every waking hour was spent on working out how to improve my performance. 1977 started well for Dave Clark with a fourth place in the Hampstead 10 in April in 49:53 (his first time sub-50) as a build up to the AAA’s marathon in Rugby. On 7th May, 1977, representing Verlea, he finished a solid tenth in 2:21:54, two places behind Jim Dingwall who did have a cold. This led to his first GB vest for a 25Km road race in northern France. The GB team filled the first five places and Dave was fourth. Then he turned up on 25th June for the SAAA Marathon in Edinburgh. This was the year that Jim Dingwall broke my championship record by 45 seconds reducing it to 2:16:05. Willie Day recorded a very good 2:17:56 and Sandy Keith 2:18:52. After running with Dave for a long time I managed to get away to finish in 2:19:35 while he slowed a bit to fifth in 2:21:18. And that, I suspect, is the only time I have finished in front of him in a marathon. Not content, Dave actually recorded his first marathon win (in 2:22:50) on a return visit to Rugby on 4th September 1977. He ended the season with a fourth place in the Northwood half marathon in 1:03:40 on a course which he hopes was the correct length and 34th position in the UK marathon rankings. So far so good but there was a good deal more to come from Dave Clark. In April 1978 he was second (1:42:52) in the prestigious Finchley 20 (beaten by a fast finishing Tony Simmons who, ironically, had not entered the Inter-Counties Championship, allowing Dave to collect the winner’s cup. Both had been using the ’20’ as preparation for the AAA’s at Sandbach on 7th May which was the selection race for the Commonwealth Games and European Championships. Simmons won but Dave, who had been second Scot behind Jim Dingwall, developed a foot injury and fell back to finish 29th in 2:20:26, still a personal best. On holiday in Finland in the summer, he recorded 2:27:57 for fourth place in Jakobstad, and on returning to Rugby had to concede victory finishing second in 2:22:25. On 14th October he was fourth (53:55) in the famous Paris to Versailles race over 16.3 km. Two weeks later Dave finished second in the Unigate Harlow Marathon breaking 2:20 easily to record 2:17:55. 1979 was even better with Dave Clark showing real consistency at a high level. On 3rd March for Aberdeen AAC, he was fourth (51:32) over a hilly course against a classy field in the Edinburgh University 10; a week later he ran a brisk 49:10 in the Tonbridge 10; and then on the 25th March produced another PB (2:16:01 for eighth on the Scottish all-time list) when, representing Great Britain he finished second in the International Essonne Marathon in France. Dave wrote about this race in the SMC magazine. He took an early lead but at 13km his GB team mate, Paul Eales, shot off and by half way was 350 metres in front of Dave, the French champion Kolbeck and Go Tchoun Sein, a Korean who had won the classic Kosice marathon. The Korean escaped at 26 km but Dave Clark managed to move away from the Frenchman at 30 km. Eventually Paul Eales slowed down allowing Dave to pass him. He wrote “The Korean, Go, had gone and was nowhere to be seen.” Go went all right – on to win in 2:13:34 but Dave had worn the British vest with distinction finishing well in front of good English competitors like Paul Eales, Barry Watson and Mike Gratton, although North Korea won the team race with Britain second. Dave Clark showed impressive powers of recovery by running 2:18:29 for forty third in the world class Boston Marathon on 16th April 1979. Jim Dingwall was fifty eighth in 2:20:18. This was another salutary learning experience – at this time fields of thousands were unknown in Britain, and to be left in the cold for half an hour without one’s tracksuit resulted in two hours of agony. Back home the AAA’s marathon was at Coventry with Dave finishing tenth in 2:25:56, the time reflecting Dave’s caution in the sweltering conditions. Then on 8th July, I learned only too well how Dave had improved. 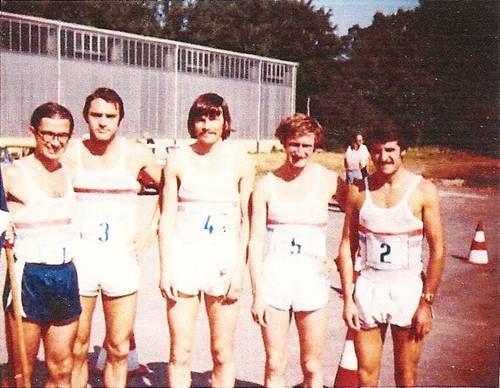 The two of us were selected to run for Scotland in the BLE (Eire) marathon championship at Tullamore which was held at the same time as a triangular athletics contest between Scotland, Denmark and Ireland. English and Welsh teams competed in the marathon too. I believe that, running into a headwind, a large group of about 20 reached halfway with Graham Dugdale of England ahead. After the turn the race speeded up and I was left grovelling to finish a miserable twenty second in an exhausted 2:30:42. Dave, however, who had impressed me before the race with his immaculate preparation for the race, involving the use of a humidity meter, came very close to winning but eventually finished only second, only 15 seconds behind Ireland’s Pat Hooper whose time was 2:17:46. A British vest and a Scottish one, plus three sub-2:20’s in less than four months. Characteristically, Dave battled on remorselessly. On 1st September, running for GB once more, he finished third (2:18:22) in the well-known Karl-Marx-Stadt marathon in East Germany. Then he rounded off a great year with fourth place in the Paris to Versailles (52:36) and second in the Pol-de-Leon to Morlaix, France. By now Dave Clark had become an experienced and well-respected international marathon runner. He was ranked eighth in the Athletics Weekly UK Merit Rankings for the Marathon in 1979. Surely this had been his finest hour? Not at all. Although injuries might have intervened to restrict Dave’s racing, he ran for Scotland in the Swintex 25km, and for GB in Le Quesnoy, France, in July before spending the summer in Switzerland and doing mountain races including twelfth place in the tough Sierre-Zinal 28 km race with 1900 feet of climbing. At the international 30km at Lillois, Belgium, in August he wore the GB vest for third place in 1:36:20. On 28th September 1980 he finished second (2:19:33) in the Berlin marathon, running by now to a highly controlled even pace regime of 16:30 per 10K. 1981 did not start well due to a number of injuries. On 29th March 1981 he was 29th (2:21:37) in the first London marathon, then on 10th May, sixth (2:20:01) in the AAA’s, seventh 2:18:42 at Sandbach in June and on 27th September, third (2:20:10) at Berlin, again after another summer in France and Switzerland racing every weekend. 1982 produced Dave’s fastest times. On 14th March 1982 he was seventh in a sizzling 2:15:06. The event was the Romaratona marathon in Rome and the course may have been 120 metres short. However Dave provided crystal-clear proof of his fitness on 9th May when he finished seventh once again, but this time in the London marathon, to record a permanent PB of 2:15:28. Even in late 2010, this makes Dave Clark 14th on the Scottish all-time list (plus 125th on the British one and 18th on the British M35 one). Dave ran two more marathons that year: on 8th August he won the Col de Lumiere race in France in 2:22:22, and following a win in the Luton 10, on 26th September he recorded 2:18:36 for eleventh (for GB again with Jim Dingwall as team-mate) in Beijing, China. 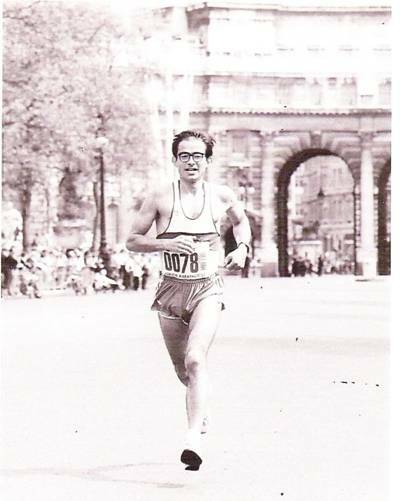 1983 started with third place (2:19:14) in Hong Kong on 22nd January, won by Jim Dingwall in 2:15:48, followed by 45th (2:16:06) in London on 17th April. Then on 29th May, fifth (2:18:19) in Geneva; on 3rd July a win in (2:21:51) in the Pennine marathon for which the prize was a trip with entry to the New York marathon. Only two weeks later he won the Caithness marathon in 2:20:34. Dave Clark was three months short of his fortieth birthday! Not content to rest he finished seventh (2:24:27) in the Adidas British Marathon in Bolton on 21st August. His veteran adventure was about to begin. He would prove to be a true ‘Master’. What a start! On 23rd October 1983 in the classic New York marathon, Dave Clark finished 40th and first Master in 2:17:30. This performance places him sixth on the all-time British M40 list, but certain of the people in front of him may well have benefited from short or downhill courses or substantial tailwinds but the NYC course is tough! Of those around Dave, only Donald Macgregor (six seconds faster on the list) and Alastair Wood actually won a World Veteran title…. Dave Clark’s success continued for four more years. By the time he had worked out that race promoters attended all the main events, and that it was relatively easy to pick up a promise of an invitation (with flight and hotel) to a race of one’s choice by doing reasonably well and talking to the right people. This resulted in some crazy choices such as Marseille (sixth in 2:26:49 on 11th March 1984) and Barcelona a week later (19th in 2:21:36). On 13th May 1984 he was 48th in the London marathon recording 2:18:38, 32 seconds behind first Master, Barry Watson. He followed that on 27th May with tenth in Geneva (2:20:02) feeling somewhat weak, having experimented with a vegetarian diet. He was back for another go at the Pennine on 1st July but this time had to settle for second place behind the Northern Irishman Malcolm McBride. On 23rd September he he took seventh place (2:20:27) in the Montreal International Marathon, Canada, running with Graham Laing as a British team; and on 28th October seventeenth (2:21:04) in NYC winning $2,200. Indefatigably Dave finished the year with a (possibly) short course fifth place 2:18:07 in Florence. What is it about these Italian course measurers? On 21st April 1985, Dave Clark ran 2:18:10 for 37th (and second Master, only six seconds behind Gunther Kopp of Germany who used to run with Victoria Park AAC’s Hugh Barrow in Glasgow). 26th May produced second place (67:49) in the first 22km Royal Sandringham Run in King’s Lynn, Norfolk. Sunday, 9th June, 1985 was the day that Dave Clark became a World Veteran Champion, with a clear win in the IGAL 25km event in Lytham St Anne’s recording 80:03 with prominent ex-international athletes Allan Rushmer second (80:49) and Tim Johnston third (81:15). Six days later the amazing Dave Clark finished fourth (2:18:51) in a marathon some distance away – Rio de Janeiro, Brazil! 20th July 1985 saw Dave win the Belgrave 20 in London recording a time of 1:43:41 (which is either first or second on the British All-Time M40 list.) It was the first time in the 34 year history of the race that it had been won by a veteran. Then he went off on a couple of so-called ‘holidays’ in the USA. On 3rd August he was second in the Kelly-Shaefer race in New London; followed by 14th (first M40) in 2:18:57 in the Twin Cities marathon in St Paul on 6th October. On 8th Match 1986 Dave Clark was forty second (and third M40) in in 48:11 in the 15km River Run in Jacksonville, Florida. He flew over to Bruges in June for a third place finish in the popular international veterans 25km, then on 20th July he finished eleventh (first M40) in 2:26:04 in the San Francisco Marathon. A fast 10K (31:47) gave him fourteenth place in the well-known but hilly Barnsley event on 28th September. And then Dave finished the year in real style! First on 12th October he won $3000 for thirty third (and first Master) in the Twin Cities marathon in 2:22:32. Then Dave picked up another $3000 on 2nd November when ending up 65th (but first Master) in the New York City marathon (2:25:35). This result hit the headlines as, at the awards ceremony Dave was presented with the award for the second M40 only to discover a few weeks later, that the ‘winner’ had not been seen by race cameras at key points. He was told the result by a national newspaper while at work in London. The obsession with racing continued into 1987 with a trip in March to the World Veterans Championships. David had been flown over for the Tel Aviv marathon a few days later so he ran only the 10K (5th in 32:01) and the 8km cross-country as preparation. He posted 2:27:36 for second place (and first M40) in the marathon. In Spring 1987, Dave at the age of 43, rounded off his outstanding career as a world class ‘Masters Marathoner’ by finishing first M40 in the Boston Marathon in 2:21:37. But there was one more: an obscure 2:46:06 in the Honolulu marathon in Hawaii, nursing a groin injury and finishing the race only by splashing the iced water offered at the drinks stations on to the aching tendon. Thereafter injuries took their toll. Dave Clark took up cycling – touring but also competing. Nowadays he lives with his wife Genefer in Oxford, and is running once more – racing over rad and cross-country for his club, Herts Phoenix. The M60 and M65 trophies have begun to take their place on his shelves – but not for the marathon. Aberdeen is proud of him. Thank goodness he didn’t win a ‘full blue’ or who knows what he might have achieved! Colin’s profile of this remarkable athlete finishes here and it really amazes me that we do not know more about him. Top class times on all five continents, GB and Scottish vests in both Senior and veteran events, on the road and in the Mountains, and I didn’t know very much about the man at all. I would hope that his inclusion here would help redress the situation somewhat and let more people know about his achievements.